This Friday I went to one of the Friday Sessions hosted by public works, they invite experts, guests and friends to participate in informal talks and presentations. To coincide with the weblaunch of the International Village Shop, the session was themed around shops, stalls and markets. Informal exchange networks, especially on the local level are increasingly being used by artists, activists, architects and economists, to circulate 'goods' within a particular locality. Principally this is to explore ways in which benefits, 'goods' and the knowledge attached, can be 'locked-in' locally and not extracted by global transnationals. and Leila Mc Alistar who runs Leila's Shop on Arnold Circus. Christian presentation was particularly inspiring. Working with Surinamese and Ghanaian communities in the Bijlmer district of Amsterdam he activiated a local trading community using a modified currency. 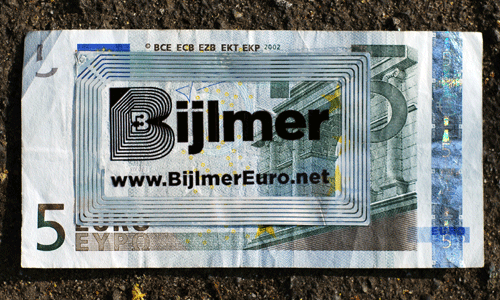 Sticking repurposed RFID tags (radio-frequency identification tags) scavenged from disposable travel cards on to standard banknotes, enable Christian to map networks of trade. Local shopkeepers offered %10 or %15 discount to customers using the modified notes in exchange for great publicity and an increase in trade. Canny customers shopped in local stores to profit from the discounts and so the neighbourhood prospers because various values are 'locked-in'. Leila I know well, her shop has helped transform my neighbourhood in the east-end of London. And Kit organized a workshop in Wysing a while back that I participated in. It was an interesting evening with lively exchanges, which clearly connects to my interests in the circulation of artworks, exchange, markets of ideas and even IndustrialTownFuturism.